Judges have discussed, debated and deliberated the entries to this year’s Museums + Heritage Awards and Lincoln Castle Revealed has added another commendation to its growing list of 13 industry awards. The winners were announced by comic, Marcus Brigstocke, at a glittering ceremony on the evening of Wednesday 18 May at 8 Northumberland Avenue, London. 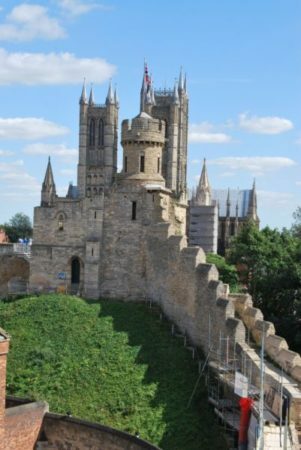 Woodhead Heritage, the specialist Conservation Team of Robert Woodhead Limited delivered the Lincoln Castle Revealed project which included the conservation of the Castle Walls and Restoration of the Castle Prison. Woodhead also completed Lincoln Castle’s award-winning sustainable Heritage Skills Centre, Also designed by Arrol & Snell. The annual Museums + Heritage Awards for Excellence, now in its fourteenth year, recognise projects of excellence, innovative and groundbreaking exhibitions from galleries and visitor attractions across the UK and Europe. These range from remarkable achievements and those championing their staff and volunteers who work hard to deliver inspiring visitor experiences.